This picture, which is being offered tomorrow, 19 March, at the The South African Sale by Bonhams, represents an aspect of Tretchikoff's art that you probably were not aware of until now. It is, in a way, a legendary work. Only black-and-white reproductions of the painting existed. This is the first time in over sixty years when we have a chance to see it as it is, in colour. Blind Beggar is the Master of the Exotic at his most sombre. Executed without even a hint of glamour, it demonstrates that the scope of Tretchikoff's work was much broader than usually believed. 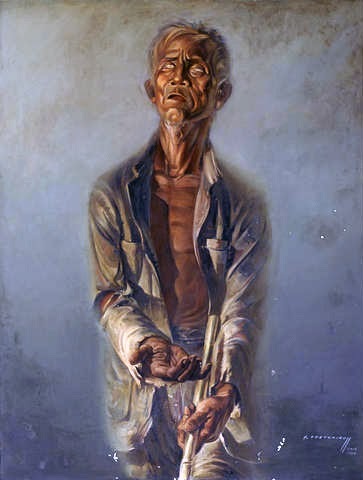 Tretchikoff's mentors in Shanghai in the 1930s often painted local 'types': coolies, beggars, workers and monks. For these Russian émigré artists, it was a way of learning the 'soul' of the Orient. 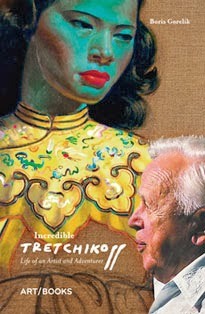 Tretchikoff produced this canvas in Jakarta, under Japanese occupation. He had just started painting full-time. One day in 1943, he and his Javanese lover and muse Leonora Moltema saw a beggar at the side of the road, staring sightlessly at the sky. 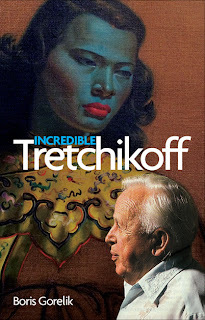 Tretchikoff found the image so evocative that he invited the man to sit for him. In 1948, in Cape Town, the Blind Beggar, was among the works Tretchikoff submitted to the newly convened committee that had to determine whether his paintings merited exhibition at the Association of Arts gallery. This was supposed to be his first one-man show after the war. The committee rejected his submission, which marked a beginning of his confrontation with the South African art establishment. Eventually, Tretchikoff rented a private gallery and had his first exhibition in South Africa. It proved to be a phenomenal success, which turned the previously unknown artist into a celebrity almost overnight. Blind Beggar adorned the cover of the catalogue of his shows that year. After slight alterations, this painting travelled with Tretchikoff to the US, for his first tour of North America in 1953. In San Jose, California, it was purchased by Dorothy and Vaughn Hunter. Vaughn Hunter, an architect, designed the Rosicrucian Museum building where the Tretchikoff exhibition was held. Since then, the work was in a private collection in the US.